In this section you will find information about RLS’s visits to Stirlingshire, including Callander, Bridge of Allan and Dunblane. In August and September 1866, the Stevenson family stayed at Camp View, Stirling Road in Callander at the gateway to the Highlands. The house was one of the new ʻEast End Villasʼ overlooking the Roman camp on the main road from Stirling. Their host, Mrs. Christian Lillie, was wife to the local schoolmaster, Thomas Lillie, who perhaps instructed the teenage RLS during his stay. RLS also painted locally: a watercolour of Callander was auctioned at the major sale of his effects in New York in 1914. On rainy days he may instead have written parts of his Covenanter history, The Pentland Rising, his first printed work, published only a few months later in November 1866. ‘I was standing out on the little verandah in front of my room this morning, and there went through me or over me a heave of extraordinary and baseless emotion. I literally staggered. And then the explanation came, and I knew I had found a frame of mind and body that belonged to Scotland, and particularly to the neighbourhood of Callander. Very odd these identities of sensation, and the world of connotations implied; Highland huts, and peat smoke, and the brown swirling rivers, and wet clothes, and whisky, and the romance of the past, and that indescribable bite of the whole thing at a manʼs heart, which is – or rather lies at the bottom of a story (The Letters of Robert Louis Stevenson, ed. by Bradford A. Booth and Ernest Mehew, vol viii [New Haven: Yale University Press, 1995], p. 91). (RLS, “Memoirs of an Islet”, in Memories and Portraits [London: Chatto and Windus, 1911], p. 69). (Letter from RLS to Henrietta Milne, 23 October 1883, from The Letters of Robert Louis Stevenson, ed. by Bradford A. Booth and Ernest Mehew, vol iv [New Haven: Yale University Press, 1995], p. 190). His poem “A Good Boy” (later published in A Child’s Garden of Verses ), was inspired by his childhood days in Bridge of Allan. You can also read about his impressions of Bridge of Allan in “Memoirs of an Islet” in Memories and Portraits (1887). When RLS was a child, the Stevenson family often summered in Bridge of Allan, Scotland. At the time, this was a popular spa. The Stevensons visited it, as well as North Berwick and Peebles in the summer, for both Stevenson’s own health and that of his mother. In his Robert Louis Stevenson: Ancestral, Personal and Literary Associations with Bridge of Allan (Stirling: A Learmonth & Son, 1932) Alexander Morrison carefully documents the Stevenson family visits to Bridge of Allan. According to Morrison, the Stevensons went to Bridge of Allan in May and June of 1853. There, on 20 May RLS and Cummy went to the Free Church and his mother recorded RLS “got a sweetie before he went in and kept it in his hand the whole time. The Servant in our lodgings thinks he should be ‘put in the papers’ as something extraordinary” (Margaret Isabella Stevenson, Stevenson’s Baby Book [San Francisco: John Howell, 1922], p. 44). On 12 June 1853, RLS went to the Bridge of Allan Episcopal Church. The Stevensons were next in Bridge of Allan on 10 April 1857. This time, according to Morrison, they stayed at “Mrs Haldane’s Lodgings” (although Morrison was unable to find a record of where this might be). Autumn 1865: According to J.R. Hammond in A Robert Louis Stevenson Chronology (Basingstoke: Macmillan, 1997), during this period RLS had a series of private tutors who would accompany him when the Stevenson family travelled to popular resorts for health reasons (including Dunoon, Rothesay, Torquay, Bridge of Allan, North Berwick and Peebles). 27 April 1867: staying at the Royal Hotel (according to Bradford A. Booth and Ernest Mehew in The Letters of Robert Louis Stevenson, this visited lasted roughly from 16 March to 27 April 1867). During this visit the Stevenson also stayed at Darnley House. 4 April 1872: RLS spent all of April of 1872 in Dunblane, recovering after a long winter of bad health. He arrived in Bridge of Allan on 4 April 1872 after his law classes had finished and then headed to Dunblane for the rest of the month. c. 25 December 1872 – 1 January 1873: RLS and his cousin Bob Stevenson spent Christmas together in Bridge of Allan. On 30 December RLS went for a drive, seeing Stirling in the distance, the Ochil Hills, and Blairlogie. 17 September 1873: Queen’s Hotel. During this visit, just RLS and his father stayed in Bridge of Allan. 29 January 1875: RLS and his parents visited Bridge of Allan. During this trip, Stevenson records walking along the Darn Walk. 26 June, 3 July and 10 July 1875: staying at the Queen’s Hotel. During these visits, only RLS and his father were staying in Bridge of Allan. 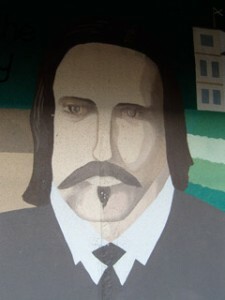 Bridge of Allan celebrates its association with Robert Louis Stevenson. There is a plaque commemorating his visits on the Queen’s Hotel (now Adamo Hotels on 24 Henderson Street). There is also a plaque dedicated to him on Fountain Road. The Bridge of Allan tourist information suggests that RLS often visited Strathallan Pharmacy (at 65 Henderson Street from 1857, founded in 1851). The pharmacist, Gilbert Farie, was supposedly an inspiration for Edward Hyde in Jekyll and Hyde. Visitors to Bridge of Allan can also see the Paterson Clock, a memorial to the local physician Dr Alexander Paterson. According to local tourist information, Dr Paterson’s interest in horticultural and botany, may have influenced Stevenson and inspired him to write Treasure Island (1883). Indeed, Bridge of Allan is often represented as the inspiration for many of Stevenson’s great works. For example, the islet in the Allan that RLS describes in “Memoirs of an Islet” is a setting for Kidnapped (1886). Bridge of Allan’s most famous Stevenson landmark is Stevenson’s cave. According to popular legend, this cave, along the Darn Walk, inspired Ben Gunn’s cave in Treasure Island (1883). You can visit the cave by following the Darn Walk trail. The path begins at Blairforkie Drive and is marked “Allan Walk”. Although it is impossible to know how much influence different places and people had on RLS’s writing, the cave certainly fascinated him. In a letter to Fanny Sitwell he wrote: “There is a little cavern here, by the side of a wide meadow, which has been a part of me any time these twelve years – or more” (Letter from RLS to Fanny Sitwell, 31 January 1875, from The Letters of Robert Louis Stevenson, ed. by Bradford A. Booth and Ernest Mehew, vol ii [New Haven: Yale University Press, 1995], p. 112). (RLS, “Old Mortality”, in Memories and Portraits, The Works of Robert Louis Stevenson, Swanston edn, vol ix [London: Chatto and Windus, 1911], p. 29). RLS spent all of April of 1872 in Dunblane, recovering after a long winter of bad health. He arrived in Bridge of Allan on 4 April 1872 after his law classes had finished and then headed to Dunblane for the rest of the month. He spent much of his time in Dunblane walking along the Allan waters.